I was talking to Hugh Grant the other day and we both agreed that being a celebrity can be hard, if it isn’t the Murdoch run newspapers trying to tap your phone, open you mail and go through your empties it’s the wonderful general public, bless them all, who can get a little carried away and storm your book signings just wanting to stroke you, and I have to say that happens to me a lot although I was surprised to hear that it happened to Huge (my pet name for Hugh). Sometimes this Cat who writes blogs thinks that as a celebrity in constant demand by an adoring public you just have to get away, go into hiding or use camouflage, Hugh was of the same opinion but tends to think that you can hide from the public in a car parked round the back of a busy well lit street, still it takes all sorts to make the world dizzy doesn’t it? Between you and me I have been using camouflage for a while now to avoid the glare of the public and the peeping Toms of the press and believe that camouflage is a very wonderful thing. Just today I was leafing through a copy of my newspaper and spotted a whole section of pictures dedicated to animals and insects who are really rather good at camouflaging themselves. I have to say that article was an altogether more interesting than another which reported that Madonna, (with an emphasis on the ‘Mad’ she is obviously going through some sort of mid-life experience), said that the duchess of Cambridge (if you don’t know who she is here’s a tip, she’s the anorexic looking newest royal, who depending upon the newspaper you read is expecting one or several babies, if that is true where is the bulge then – in a surrogate?) is “lovely girl with great sense of style.” Sorry Madonna I think it’s time to hang up your sling backs darling cos baby doll you have lost it! Instead of offering you a picture of the tired but blousy Madonna or the Mousey but skinny duchess of Cambridge I thought I would let my wonderful readers have a gawp at some amazing camouflage pictures I was so impressed with. Not all of them are animals or insects as you will see and for one sadly no amount of camouflage will help her appearance. So without further ado or character assassination I give you my little tribute to camouflage and the beasts that use it. 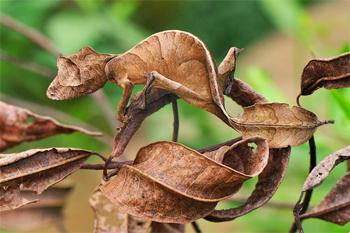 To start with how about the Leaf-tailed Gecko, aka the Satanic Leaf-tailed Gecko who blends in wonderfully with a rustle of old brown dried leaves this one lives in the Andasibe-Mantadia National Park in Madagascar? 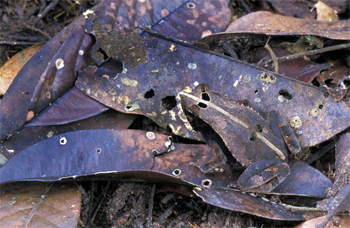 Or what about a Bat-faced Toad who has taken a tip form the Satanic Leaf-tailed Gecko above and is hiding amongst a crust of dead leaves in the Amacayacu National Park in Colombia? 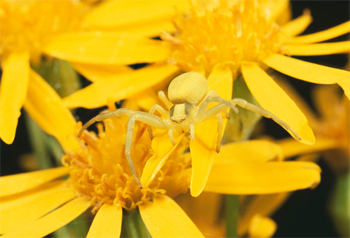 Then there is the oddly named White Crab Spider sitting on a flower near you, if you happen to live in the south of England or Wales. Humans can create excellent camouflage if they have the patience and artistic ability, but sadly unlike the animals above when they move the illusion is shattered. 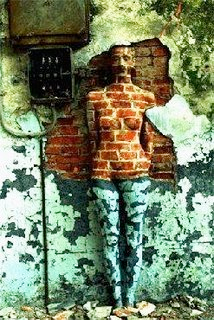 Let’s hope that this lady stays still because I think she has forgotten to get dressed this morning! Lastly, and that is where every one of all of the dozens of English queens, dukes, duchesses, princesses and princes of benefit dependency – the English royal family – would come if they weren’t so privileged, we have the amazing camouflage of the duchess of somewhere that was invented especially to accommodate her. 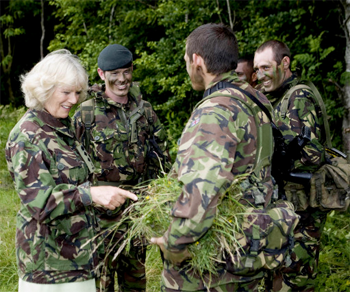 As you can see she blends in rather well with the soldiers, some might say that she looks the most ‘rugged’ of them all! Do you like me wonder what she is pointing at around that soldier’s crutch? She seems to be very interested in ‘something’ down ‘there’ don’t you think? If you want to see more of these overrated royal individuals they can be found posing in army, navy and air force uniforms on state occasions (which makes you wonder if the English state isn’t a military one?). Oddly enough the royals are almost always dressed up in very high ranking positions in their chosen armed force I wonder just how they earned this exulted ranks? Beats me! If you want to get a good look at the English royal family the best place to spot them is on holiday somewhere very warm while the British newspapers sing their praises and extoll their virtues at home telling the English people just how hard the royals are working!